Spring always signifies new life, a resurrection after a long, wet winter. I love to garden and now that the rains have subsided I am out digging in the dirt, pulling so many weeds…ugh, fertilizing and planting.There is nothing like seeing a new bud, or flower, blooming that you coaxed to life. It is a birth without the extreme pain…a little pain, yes, of the gardening sort, but nothing like real childbirth, believe me! New life is a joyous occasion. I feel the same pleasure taking worn furniture pieces, albeit with good bones, and giving them new life and making them relevant for today. It all starts with inspiration. For our Cali Cape Cod project dining room, we wanted a settee with beautiful carvings and distinctive motifs. In the process, one has to keep an open mind on what you might find and the cost to transform a storied piece. 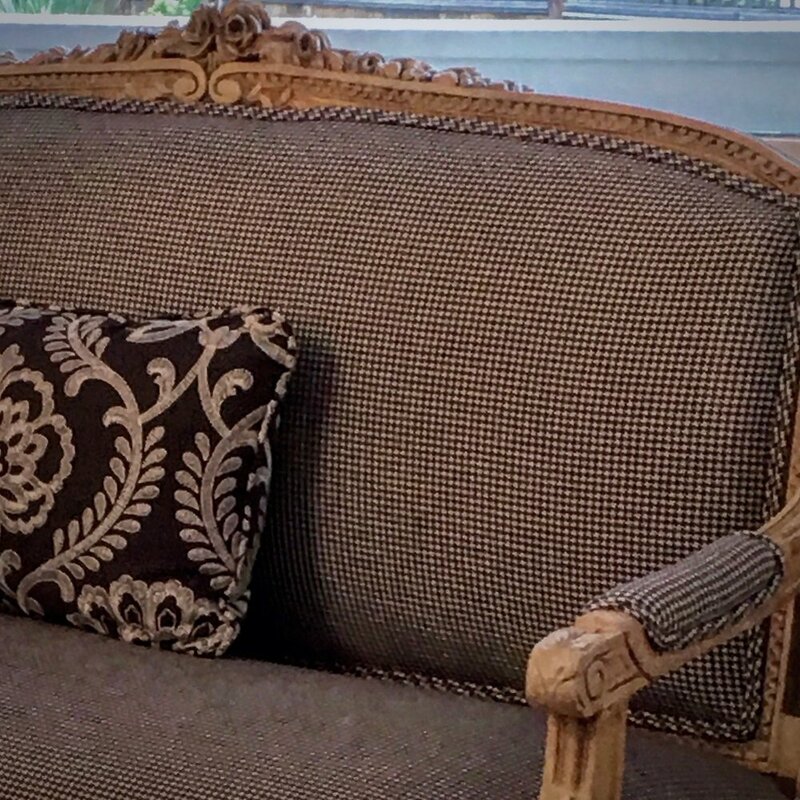 By the time you pay for the piece, the refinishing, the reupholstering it may not be the bargain you thought it was, but it will be a gem, a diamond in the rough transformed. It is not always easy to find the attributes you are looking for in a piece of furniture, especially in a newly manufactured piece. So begins the hunt! We scavenged the online consignment sites that have emerged in the last decade, much to my delight and fortune; Chairish, Sotheby’s, Incollect and others. There is such a wealth of options it literally takes hours to comb through the selections on each of these sites but it is well worth the reward when you find that perfect hidden gem. 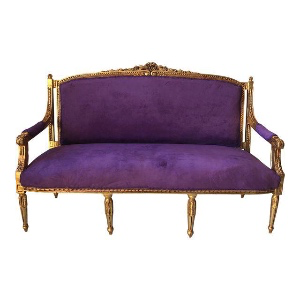 Lo and behold, we find it on Chairish, with royal purple upholstery and a gilded gold frame….hmmmm. The bones of this piece are great but we don’t know what might lurk underneath this guilded lily. Once it is delivered to the refinisher’s, we discover that the settee is not made of carved wood at all, but resin, which requires a whole different set of skills to transform it into the piece we envision. After a lot of discussion, angst, more discussion, more angst, and effort with our refinisher and myself (ok, I admit I carried most of angst) in the end we achieved what we set out to do! What do you think? Did we transform this piece? Did we achieve our goals? For another project, we wanted a small settee that was distinctive yet simple for the foyer of the client’s Pebble Beach home. We pre-selected a hand block printed linen from Penny Morrison for the upholstery. We just needed the perfect settee to compliment it. 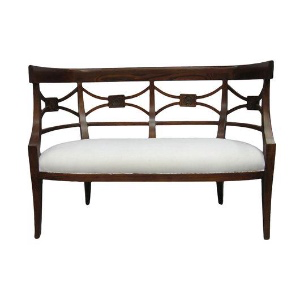 Again, we scoured the online consignment “shops” and Chairish came through for us with this beautiful petit settee with a distinctive carved wood motif. It was in great shape. 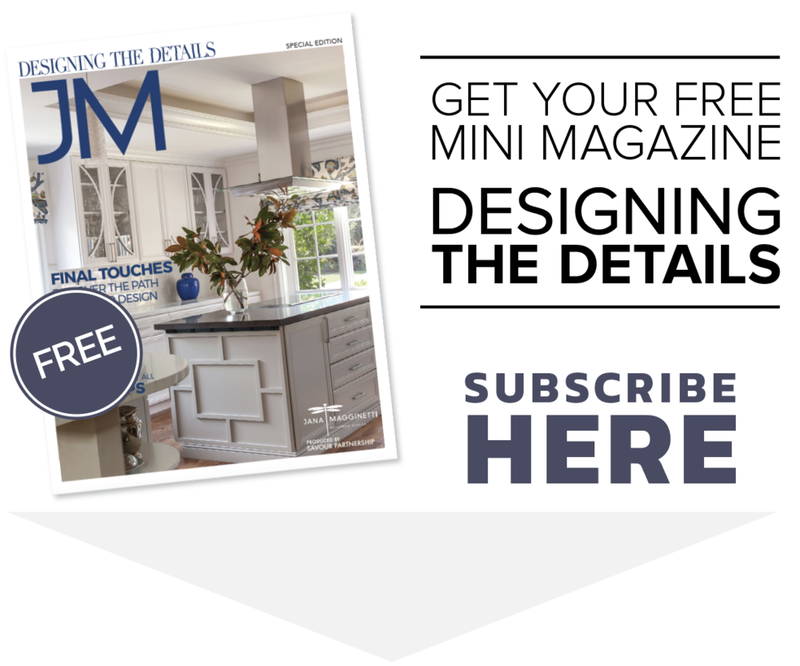 It only needed a little repair to the structure, a darker finish to fit the fabric and the overall concept of the home. It is so satisfying to see what was an outdated ugly duckling get transformed into a beautiful swan that compliments the home, tells a story of its own, and is cherished by its new owners. Bringing new life to an old furniture piece is an exhilarating part of the creative process…always keeping a watchful eye out for what could be.